The immunity of operational amplifiers is a trend topic for electromagnetic compatibility EMC community. Radiofrequency interference is usually applied to the operation amplifier and the voltage offset is monitored as a parameter to evaluate the EMC degradation. However, this method does not provide enough information to know the probability of failure to electromagnetic interference of the devices. In this paper, an alternative statistical analysis based on the Weibull distribution is used to analyze the electromagnetic immunity performance of operational amplifiers under different frequency interferences and modulation index. 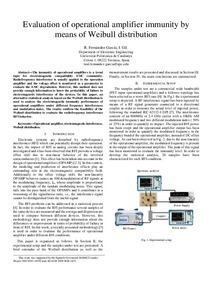 The results confirm the feasibility of the Weibull distribution to evaluate the radiofrequency interference RFI behavior. The immunity of operational amplifiers is a trend topic for electromagnetic compatibility EMC community. Radiofrequency interference is usually applied to the operation amplifier and the voltage offset is monitored as a parameter to evaluate the EMC degradation. However, this method does not provide enough information to know the probability of failure to electromagnetic interference of the devices. In this paper, an alternative statistical analysis based on the Weibull distribution is used to analyze the electromagnetic immunity performance of operational amplifiers under different frequency interferences and modulation index. The results confirm the feasibility of the Weibull distribution to evaluate the radiofrequency interference RFI behavior. Fernandez, R.; Gil, I. Evaluation of operational amplifier immunity by means of Weibull distribution. A: International Symposium on Electromagnetic Compatibility. "Proc. of the 2013 International Symposium on Electromagnetic Compatibility (EMC Europe 2013)". Brujas: Institute of Electrical and Electronics Engineers (IEEE), 2013, p. 220-223.